The Ethnological Museum, together with the Saint Louis Art Museum in the United States and the Musée du Quai Branly in Paris, is the first to present this comprehensive show of art from New Ireland, compiled from collections in the USA, Europe and Australia. The exhibition presents over 150 sculptures and paintings of outstanding artistic quality. Among them are the famous Uli figures with their sturdy breasts and large penisses. 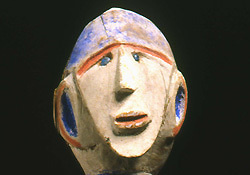 The Uli figure has become a favoured object among collectors of oceanic art, and a poet as famous as André Breton sang its praises in a Surrealist poem. The publication of Emil Stephan's decisive work on the art of the South Seas ("Südseekunst") in Berlin a hundred years ago coincided with Pablo Picasso's creation of his famous painting of "Les Demoiselles d'Avignon" which is often regarded as the starting point of European modern artists' engagement with extra-European art. Commissioned by the Berlin Museums for Ethnology, Stephan returned to New Ireland in order to carry out new research on the carvings which are nowadays regarded as the most important artistic creations of the South Seas. As objects which received early European attention, they soon acquired a high status among collectors and can now be found in museums worldwide.